Summer means balmy weather, longer evenings and a more leisurely pace of life. If you’d love to sit back and enjoy your garden but are too busy planting weeding and watering, it’s time to stop. Take a closer look at yard care habits that are wasting your time, not to mention money and natural resources. Then apply the following easy-to-do life hacks to simplify your lawn and garden maintenance routine … and give you more time to relax. Stop fighting Mother Nature. Do a soil test and find out which nutrients should be added to your yard to grow healthy grass or other plants. Choose a species of grass that will flourish in your particular soil and climate conditions. These actions will pay off in terms of a yard that needs weeding less often; the right grass in the right soil generally crowds out weeds. Mow your lawn less. Adjust the lawn mower height to 2-3 inches (and use a manual or electric mower for the sake of the planet). Your grass doesn’t need a crew cut and in fact, the “longhair look” will expose more leaf surface to the sun’s rays, enabling it to photosynthesize more efficiently. This makes your grass stronger, more drought resistant and better able to compete with weeds for space in your lawn. While you’re at it, start fertilizing less as well. Twice a year – once every spring and fall – is plenty. Make peace with the grass at the edge of your flower beds. 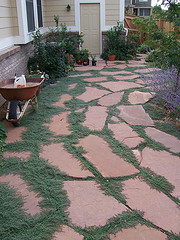 You’ll have no need to use a weed whacker to cut in close to stone borders if you set the stones level with the earth. This also holds true for flagstone paths. Find an alternative to your dream of creating a golf course in your backyard. Mega-lawns are also mega-water guzzlers. Replace at least part of your grassy lawn with native plants, especially if you live in a drought-prone area. Pozo surf, a hardy bush with attractive bright green foliage, would be an excellent choice for the dry San Diego landscape, for example. Use less water for your lawn and garden. One inch of water weekly is recommended for both lawns and vegetable gardens. Subtract the amount of rainfall per week from this figure to calculate how much you'll need to supplement. Water early in the morning to minimize water loss due to evaporation. Watering deeply 2-3 times a week – rather than sprinkling lightly every day – promotes deep root growth, increasing efficent utilization of moisture and resistance to dryness and heat. Direct water toward the roots instead of the upper part of the plant; wet leaves are more vulnerable to sunburn. Use *even* less water for your lawn and garden. Set up a rain barrel (simple) or graywater (more complicated but worth it in the long run) system to recycle water from precipitation or household runoff for use in hydrating your lawn and garden. Consume less water for your water feature. We may sound a tad obsessed by this point but water conservation is such an important way to help the environment … and it reduces your bills as well, so here goes: Recirculate the H2O used by your yard’s water feature with a closed loop system. Or go even more green by harvesting rainwater for your fountain, waterfall or pond. Let your lawn breathe free. Aerate it – a project that is simple to DIY – twice a year, in springtime and autumn, to improve drainage and allow air, water and nutrients increased access to your grass’s roots. Give up on weeding your vegetable garden. There is a modification you can make for next year that will revolutionize your gardening habits. Replace your conventional veggie garden with raised beds, raised rows or containers. Besides less weeding, these offer many other benefits: a smaller area that needs mitigation through fertilizing and composting, better water retention in sandy soil, improved drainage in clay, less soil erosion and fewer pest like snails and slugs.